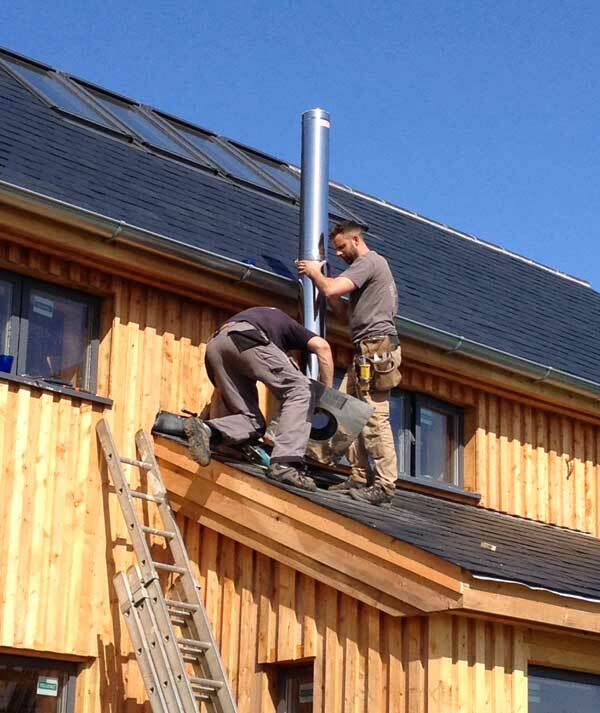 You would think that building a house off-grid using solar panels to make our own electricity would be renewable and innovative enough, but our latest renewable is probably the most innovative and possibly the closest to the leading edge we’ve come, to date. Our off-grid ambitions grew out of a desire to burn as few fossil fuels as possible. 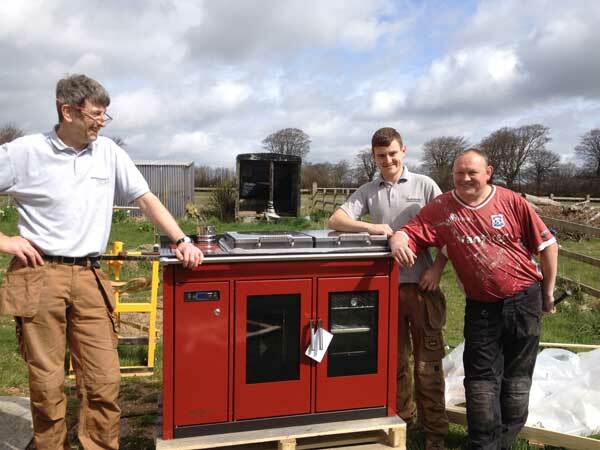 Roderick James Architects understood this and found the Klover Smart 120 – a biomass boiler that has an oven and an enormous hot plate for cooking. Seems to be the only one of its kind and it has been a long time coming. I started talking to Firepower, the distributors, about finding a heating designer/installer for the Smart last March. Not March 2015, LAST March. 2014. But luckily Mike Coke and Tasha Norman at Firepower never gave up on Easterdown, despite most of the installers refusing to design a system for Easterdown. 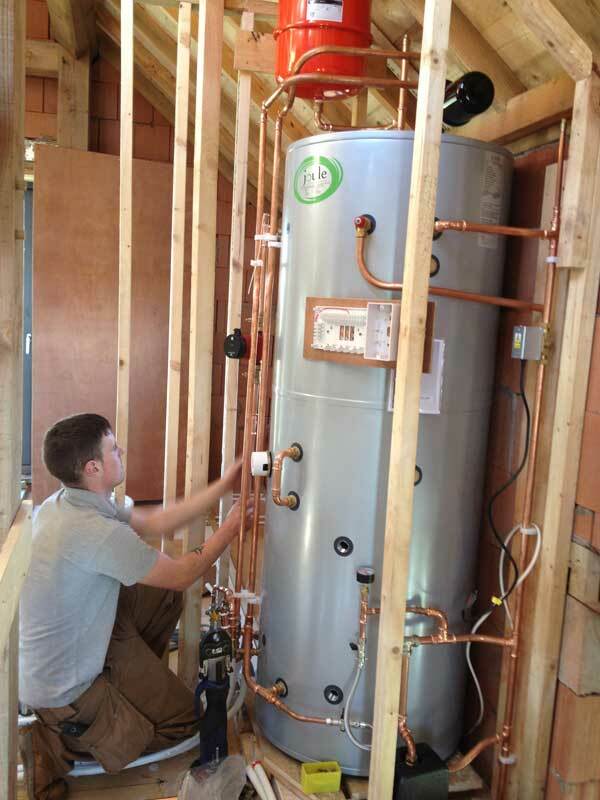 I will never know why I couldn’t get a full quote out of these installers, but I’m pretty certain that it has something to do with putting this super boiler into our super insulated house. 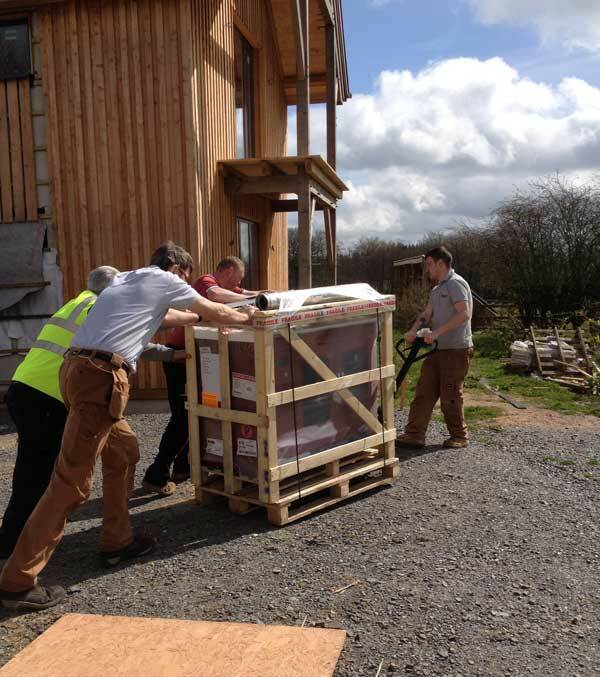 The Klover Smart 120 is new and I think we may be the first new build house to install one in the UK. 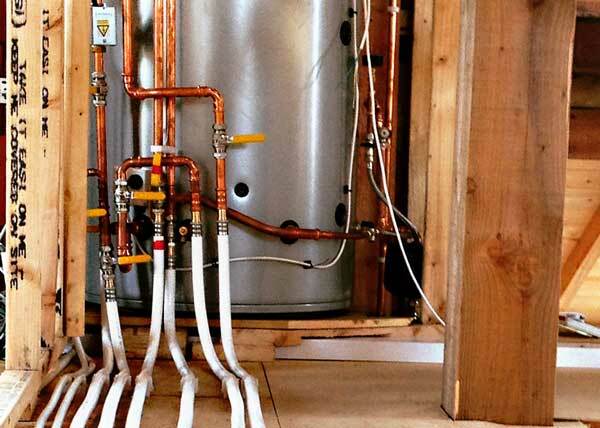 One installer was concerned because the Smart is first and foremost a boiler. You can only cook on it if it is heating your house. 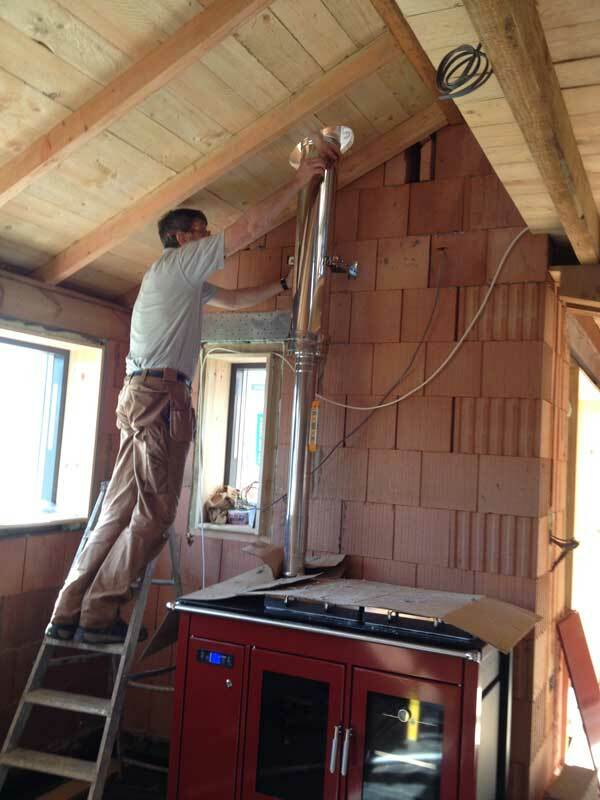 So we have a very small heating requirement, as the house is so well insulated, but we want the Smart to do all of our cooking. No electric or gas cooking in the background to help out. One solution to the heating/cooking imbalance could have been to create lots of pumped circuits to take the heat away at times we want to cook, but the fact that we make our own electricity rules that out. So to be fair, we weren’t the ideal client. Then Mike from Firepower rang to tell me that their newest installer is someone who really thinks about things differently. He was in Wales but might be willing to come to Easterdown. Simon’s brilliance is this design – an enormous Thermal Store which acts like a heat battery. The Smart charges it up with heat and it will supply our direct hot water and underfloor heating because it can efficiently store the heat ready for when we need it. It is sized and designed to ensure we can cook when we want to. 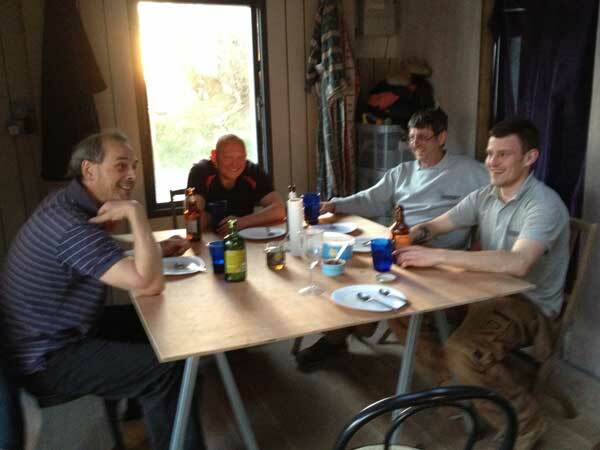 End of day one – Evening meal proves that our Cabin can seat and feed 5! And, because Ruby is programmable, it will heat water without us waking up to light or start it. For the last year in the cabin I’ve woken up to light the Esse so we can shower a few hours later. Sometimes this has been as early as 3am. From now on I get 2 hours of extra sleep in the morning. Off-Grid LUXURY!!!! Fantastic Mike and Vickie – great post! I am so pleased that you decided to go for it! I’m sure you and Ruby will have a great future together! So glad you are happy with the Installation and thank you both for your hospitality it has been a pleasure. We are sure you will have many happy cooking sessions with Ruby and should you need any cake making advice Simon is your man. Thank you from all at Renewable Innovations. Simon from Renewable Innovations suggests I contact you to discuss my project which is similar to yours. I’m building/reconstructing a cottage on my family farm in Lincolnshire and the only mains service it currently has is water. 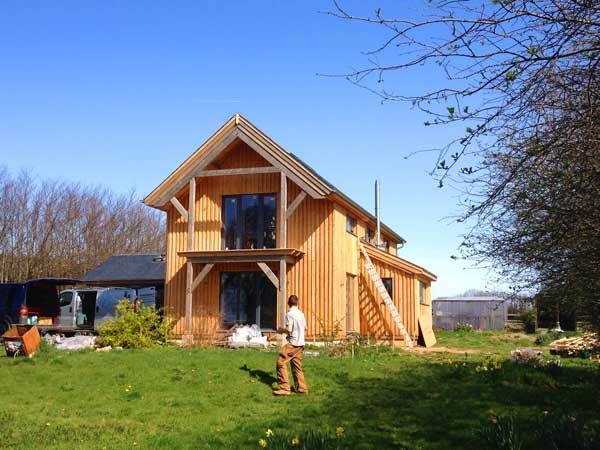 I’m really keen to live off-grid (though maybe my partner Abi is not so sure). I’m currently favoring a domestic anaerobic digester feed a CHP and directly a gas hob/oven with a diesal generator and batteries with underfloor heating. I aim to introduce a wind/solar solution once we are living there and the renewables market has settled. I also considered GSHP but pre-limary calculations suggested I needed 3.5 tonnes of batteries to get me through the night! Obivously you are no doubt very busy but if you have some spare moments it would be useful to understand how you arrived at your solutions. then you may want to seriously consider it. When I looked at the planning application for the one in Northamptonshire I rang EVERY bioscrubber filter company and came away thinking that this is the very weak link in the design and technology of them, and there is no investment in making the supposed ‘bioscrubbers’ actually work. I have only one opinion regarding the decision to live off-grid – it must be in proportion with your willingness and ability to be hands on. Regarding waiting until the market has settled – We have been living here, off grid for 18 months, 12 of which are purely solar and battery. 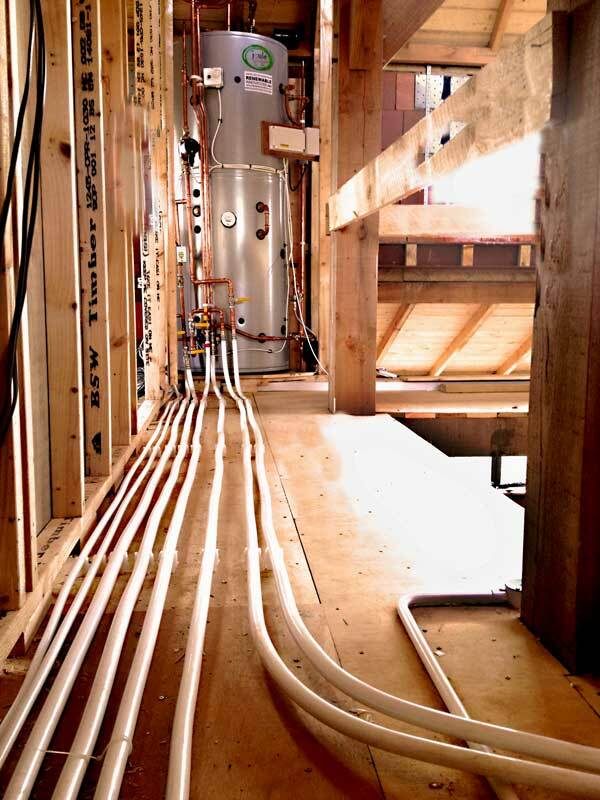 We haven’t been able to register for any tariffs because we don’t have our air-tightness EPC yet. Have you found out what it would cost to connect to the grid? Compare that to the price of solar and batteries. But whatever you do, don’t tell any potential installer what it would cost to connect to the grid. And we have an LPG generator (conversion). Highly recommended. We couldn’t find anyone to maintain the small diesels and ours kept breaking down. Bit on the blog about this – the next generation. I noticed from your map that there was a sheep wash nearby. Do you have a watercourse? I would be very tempted to do hydro if you do. I hope by now Simon has forwarded my email address to you, if not please let me know. (don’t go by the admin one here) I am happy to talk about this any time. 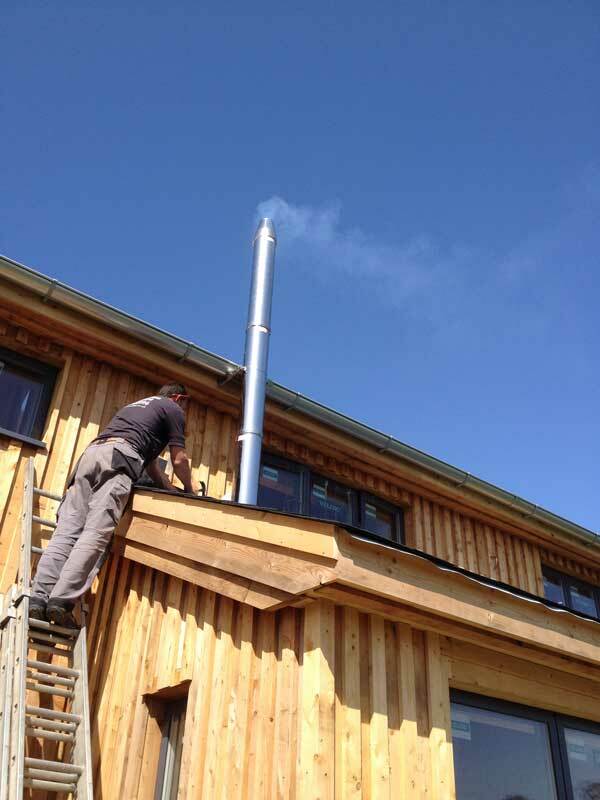 I know a few people here that have had huge problems with their biomass boiler installations. 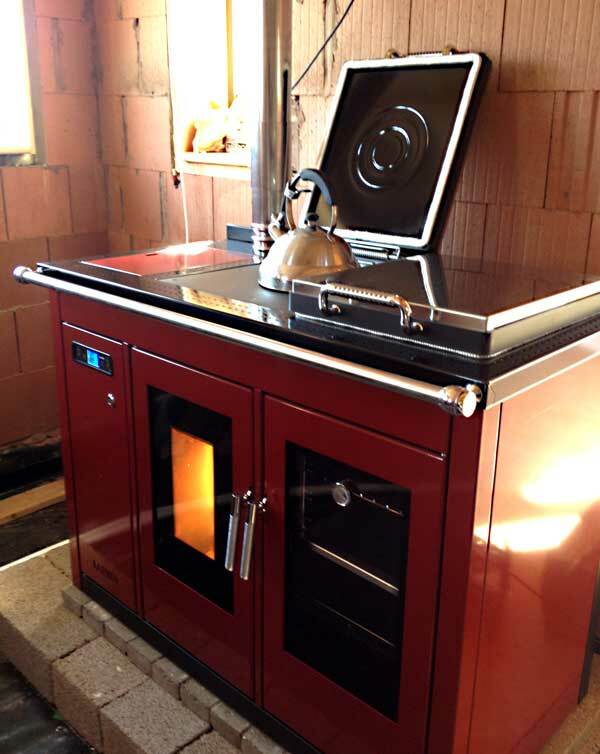 Their experience has shown me how lucky I was to choose the Klover Smart 120 and my installer, Renewable Innovations. 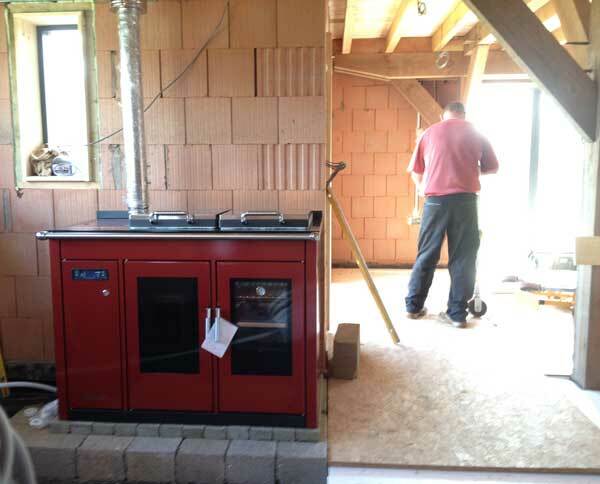 Firepower, who distribute the Smart 120 will only let installers who they have trained themselves work with one. I think this must be the key to getting a good biomass boiler. Firepower tell me that they do have a good, trained installer in Ireland. I love Ruby and cannot recommend the Smart 120 highly enough. She cooks like an Aga oven and cooktop except the response is really quick from cold by comparison. 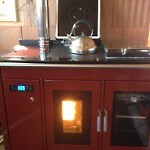 She is a workhorse that runs our underfloor heating and supplies hot water as well. Your home looks amazing! Congratulations and thank you for all that you are doing. Can you tell me, do you have a cooker extractor fan in the room with Ruby Smart? 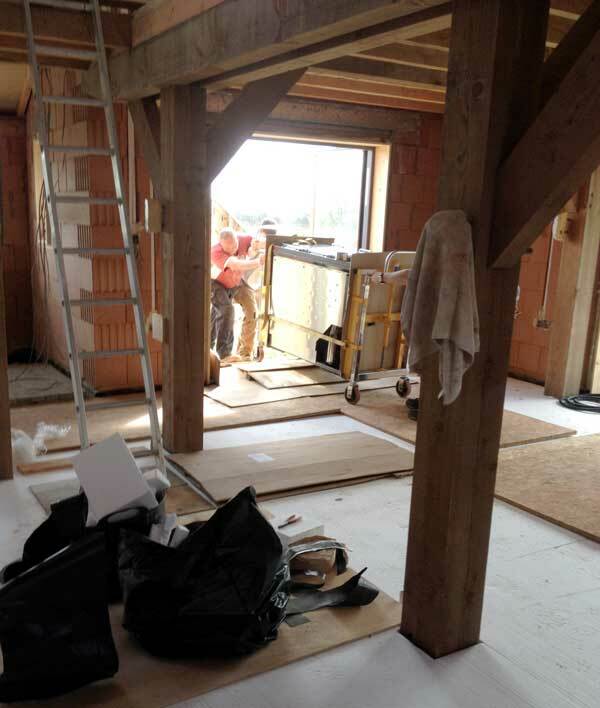 No extractor yet as we are still deciding on the design of the kitchen. 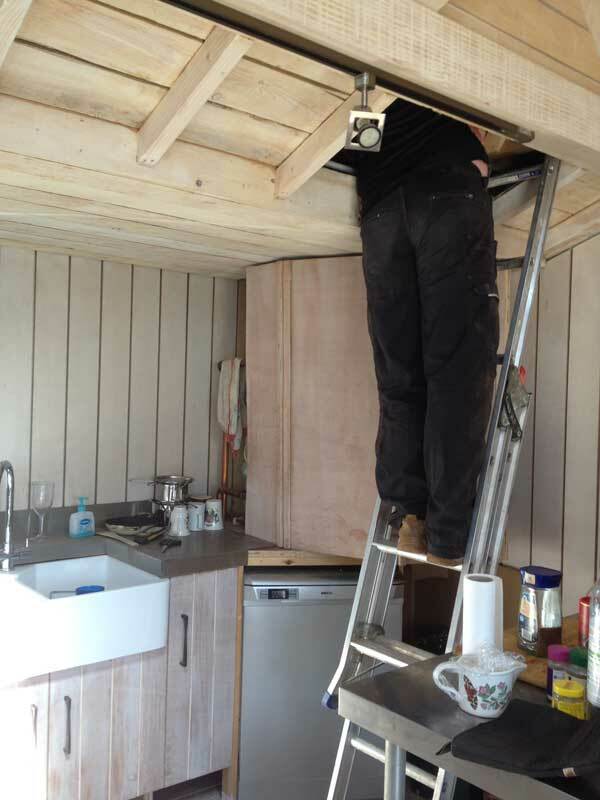 We are likely to choose a filter type extractor as we don’t want to drill yet another hole in the house. 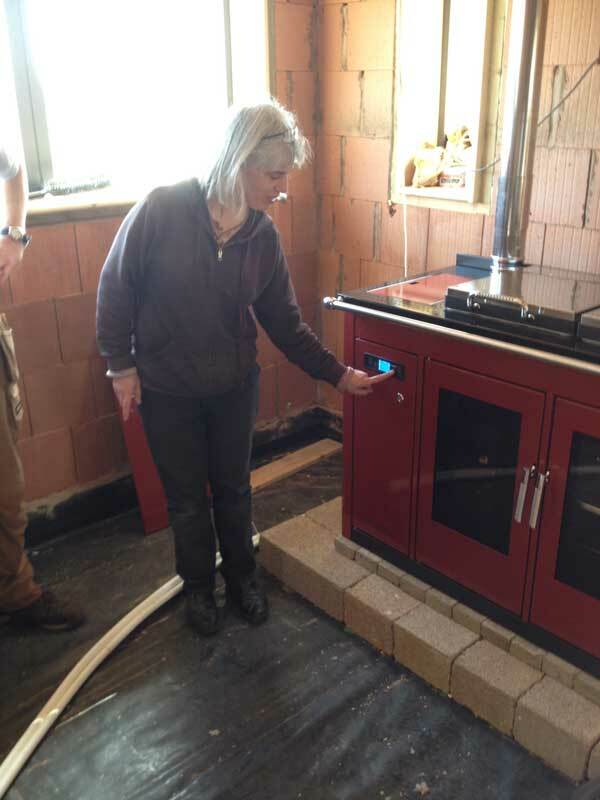 Ruby, like all wood burning devices requires a 100mm hole, but we have seen that we can have a kit to bring the required air to her through a pipe and we will get that installed at her next service. Thank you for the compliment on our home.